With a pair of powerful lunging dribbles, North Medford senior Kaison Faust unleashed a ferocious two-footed slam, just narrowly missing the hell-bent Will Sheaffer who tried to rip the ball free on the ascent. In what felt like a flash, Jesuit's double-digit lead had dissolved. Trailing in the second round of the Class 6A playoffs 32-20 at the half, the Black Tornado stormed back with a 12-2 third-quarter surge that not only stemmed the tide but put the Crusaders on their heels. Faust's slam to start the fourth tied the game up at 45-45. Completely in control in the first half, Jesuit found itself in a bare knuckle fist fight. Yet, with its season teetering on the brink of extinction and the Chiles Center dream slipping away, head coach Gene Potter put the ball in his senior stars' hands. Matt Lang and Joe Wall earned the right to decide Jesuit's fate. Over the last three seasons, the sharpshooting duo has morphed from specialized marksmen into bonafide all-around playmakers. In a Potter offense predicated on democratic shot selection and the extra pass, those two seniors became the ones capable of taking over a game, guys who can get their own shot or create for others. And when the contest was at tightest, Lang and Wall were at their best. 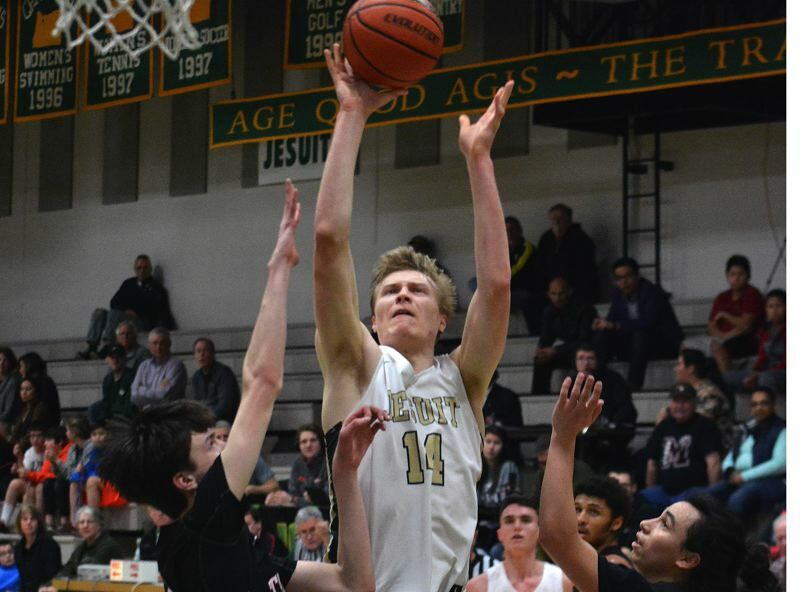 The duo combined for 16 of Jesuit's 22 fourth-quarter points and helped propel a 13-0 Crusader spurt in the final stanza that ultimately earned a 66-51 win over the Black Tornado on Saturday at Jesuit High School. The No. 8 Crusaders will take on top-seeded and defending state champion Jefferson in the 6A quarterfinals on Thursday at 1:30 p.m. at the Chiles Center. "Everyone wanted this game so bad," Lang said. "We didn't want to lose our last game at Jesuit. We just had so much drive. The crowd got into it and that gave us energy. Our bench was into it. And when you get some big buckets and stops on defense, the whole atmosphere gets going, so it's a lot of fun." In the last game they'll ever play at the Knight Center, Lang and Wall ensured their curtain call was an unforgettable outing. "At halftime, Potter told Matt and I that we had to keep scoring for us to keep winning," Wall said. "I think we stepped up to the challenge." In all, Lang (a game-high 23 points) and Wall (21 points) collaborated for 44 points, but it wasn't so much the number of baskets they joined forces for, but when they scored them. North Medford's 12-2 run to start the second half pulled the Black Tornado to within 34-32. Yet Wall responded with a deep three from the left wing off a cross-court pass from Lang that extended Jesuit's lead back to 37-32. When North Medford pulled within 39-38, Lang deployed a right-handed inside-out dribble into a rhythm three that pushed the edge back out to 42-38. Then, Lang used a ball screen to get all the way to the rim for two, 44-38. After Faust's game-tying slam in the fourth, Lang isolated the Black Tornado wing on the right side of the floor, beat him to the middle of the paint with his southpaw handle and fired a chess pass out to an awaiting Wall well beyond the three-point arc. Without so much as a ponder, the 6-foot-6 set shooter flicked a 25-foot three just feet from the Crusader student section that hit nothing but cotton and reclaimed a 48-45 lead. "That was a huge shot for us momentum-wise," Lang said. "I know Joe likes those angle shots, so I kicked it to him right in rhythm, he caught it, shot it, knocked it down. It really propelled us moving forward." With North Medford clinging to the Crusaders' cavalry of outside shooters and crowding Lang after the lefty buried three threes in the first half, driving lanes were open. And Lang exploited the Black Tornado alleyways, putting the ball on the floor either going left or right, absorbing contact and still finishing inside or firmly kicking the ball out to Wall. Lang's game, while based around his deadly three ball, has evolved into being much more than just a standstill shooter. Bigger, stronger and more confident in himself getting to the rim, Lang almost welcomed Faust and company trying to stay in front of him. All seven of Lang's points came at the free throw or in the paint in the fourth in addition to his two assists. "I knew I had to play well for us to win," Lang said. "With shooters like (Aiden) Williams and (Wall), the lanes were so wide open...I just took advantage of it." After Wall and Lang made three-of-four free throws, Lang confidently rocked crossovers back and forth in front of the crowding Faust, got to his right hand and floored it to the cup for an off-balance floater off the rim 53-45. 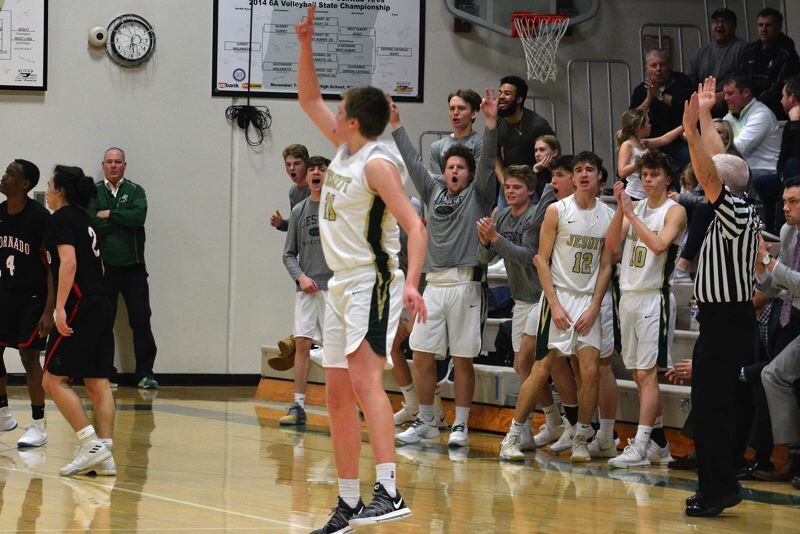 Then, Jesuit broke the Black Tornado's fullcourt press and Wall stepped into a wide-open left wing three that he swished in front of the full throat Crusader student section to go up 56-45. Clutch. Timely. Lang and Wall were both when their team needed them most. "The whole team is unselfish and they want Joe and me to take those big shots because they know we can hit 'em," Lang said. "It's great having that freedom on offense and Potter has total trust in us. We've been here before, last year and the year before that, and we feel confident in ourselves to take those big shots." 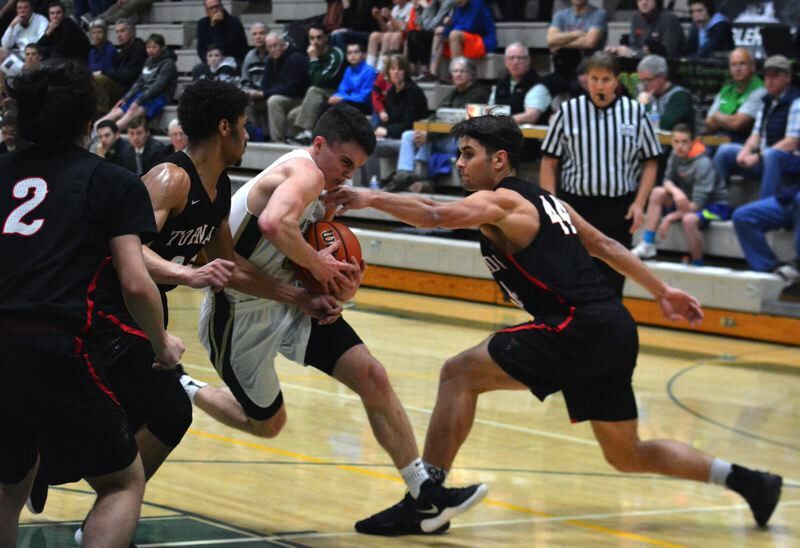 North Medford missed four straights shots, four consecutive free throws and turned the ball over twice during the Crusaders' final fourth-quarter surge, as Jesuit's team defense bolted down around Faust and held the Black Tornado to just one shot by clearing the defensive boards. 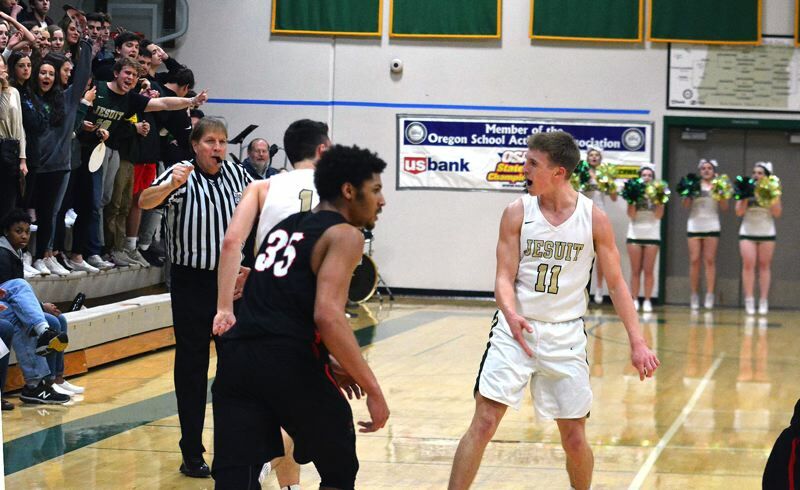 With Wall and Lang providing the offense, Sheaffer, Sam Handley and a mix of Matthew Levis, Justin Bieker and Aiden Williams emptying their tanks on the other end of the floor, North Medford ran out of gas. Jesuit's home crowd kept the pressure on in the stands too, rising with every made shot and every defensive stand. Levis' layup put the exclamation point on Jesuit's 13-0 run with 2:50 to go in the fourth. "You could tell by (North Medford's) body language that their momentum went down," Lang said. The No. 8 Crusaders will be the underdog going up against Jefferson, but don't sleep on Jesuit. In two playoff games, Jesuit has made 20 three-pointers as a team. They can get hot in a hurry and destroys Jefferson's repeat hopes with an afternoon of hot outside shooting. Lang knows most of the Democrat roster, including stars Kamaka Hepa and Marcus Tsohonis after playing with the Jefferson inside-out combination during the AAU season for Portland Basketball. Jefferson also happens to be the team that bounced Jesuit from the playoffs a year ago. Lang came off the bench for Jesuit two years ago as a sophomore, when the Crusaders finished sixth at state.